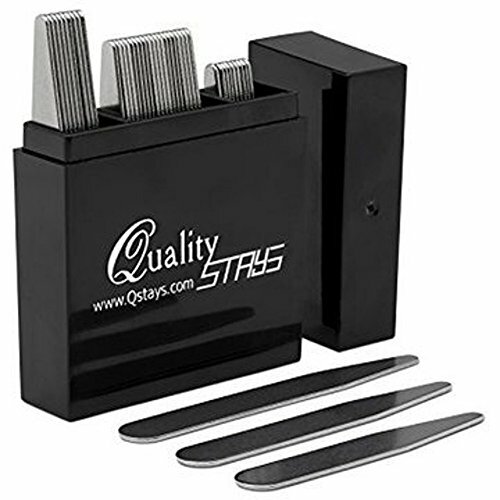 38 Metal Collar Stays - 3 Sizes in a Divided Box, by Quality Stays by Quality Stays at Mas Fashion. Hurry! Limited time offer. Offer valid only while supplies last. VARIOUS SIZES - Choose the correct size collar stay for the best fit. This set contains 10 - 2.2", 20 - 2.5", and 10- 2.75" collar stays. ATTRACTIVE DIVIDED STORAGE BOX- Easily locate the size you need with this divided box. This case is perfect for travel or everyday storage. View More In Collar Stays. If you have any questions about this product by Quality Stays, contact us by completing and submitting the form below. If you are looking for a specif part number, please include it with your message. Shang Zun 32 Pcs Plastic Multi-colored Collar Stays in a Box, 2.37"
Shang Zun 4 Pcs Natural Mother of Pearl Shell Collar Stays,2 Styles, 2.37"